We take a deep dive into three key Sea-Doo innovations for 2018 – the LinQ quick attach system, Ergolock saddle and direct front storage access. If a picture is worth a thousand words, then a video is, well, almost priceless. Written text, however, can still be the best way to tell a story. 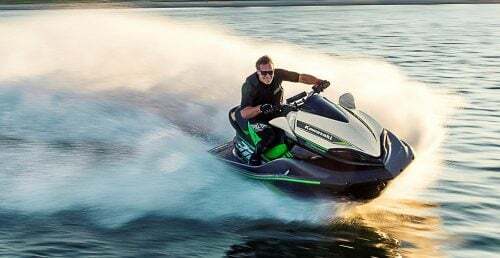 Which is all why for a more close-up look at three key Sea-Doo innovations for 2018, we’ve opted to combine all three, going in front of the camera to complement the text and photos for new GTX, RXT, and Wake models. First up is a look at the Quick-Attach LinQ System, now featured on new model’s aft deck. 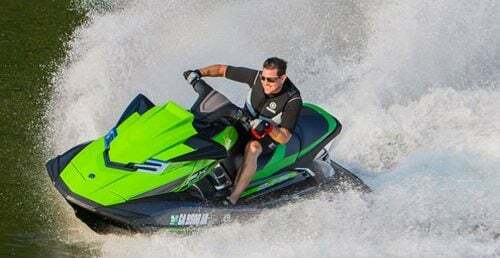 While the idea may seem new, BRP has offered it — and thus real-world-tested it — on both Ski-Doo snowmobile models as well as Can Am ATVs for years. LinQ starts with a pair of pop-up “cleats” that tuck flush within the platform until pulled up for use. 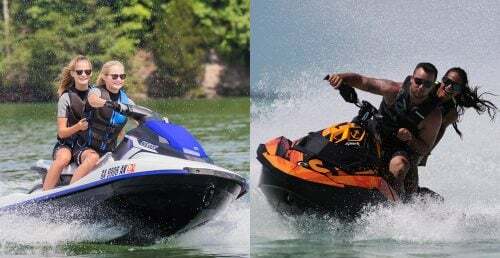 Into these cleats then pop a series of accessories, the left side of the accessory featuring a flange that tucks into the cleat base, the right side incorporating a simple quarter-turn, twist-lock mechanism to secure. 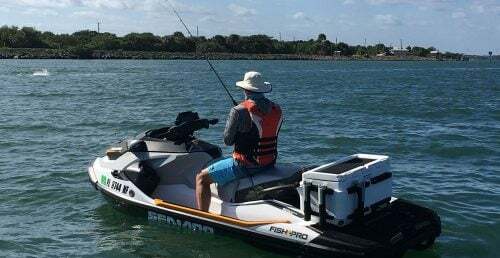 Although to speed the video along we left this locking mechanism unsecured, it proved to be extremely sturdy during both on-water usage and on-shore tugging and pulling. 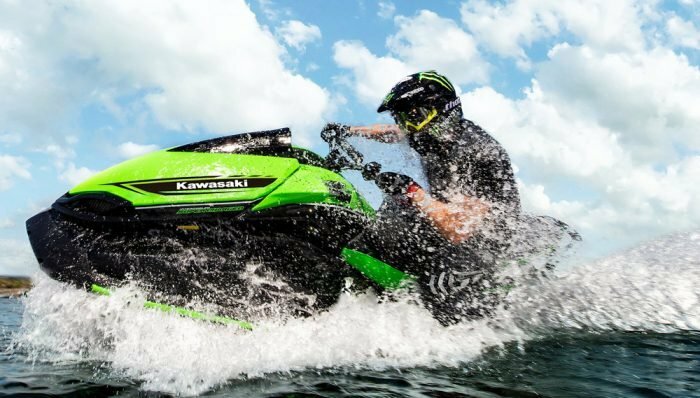 Accessories fit without play or rattle, even when aggressively cornering at high speed. 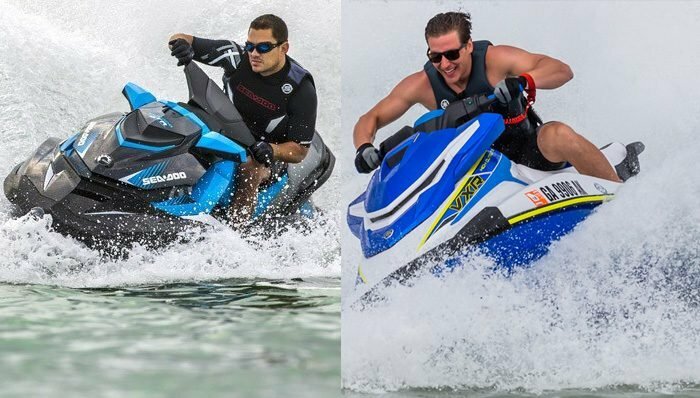 Current accessories include a 4.2-gallon cooler and 4.0-gallon gas caddy. Should you use the gas caddy, an additional 5.5-gallon semi-rigid case with internal dry bag can be stacked on top using the same mechanism to further increase storage capacity. Another change in the 2018 design is the Modular Ergolock Saddle. 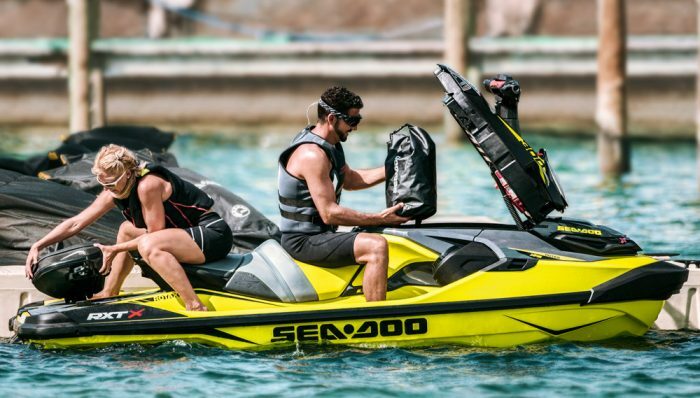 The saddle’s aft section can actually be removed to increase the available space on the aft deck or lighten the load for performance riding. The removable portion of the saddle clips in at the forward end, and secures with twin locking tabs aft. Like the LinQ system, the attachment system proves extremely secure. During our testing the saddle felt like a one-piece unit. Rattles, vibration or play were all non-existent. Why would you want to gain more space on the aft deck other than to lighten the craft’s weight? 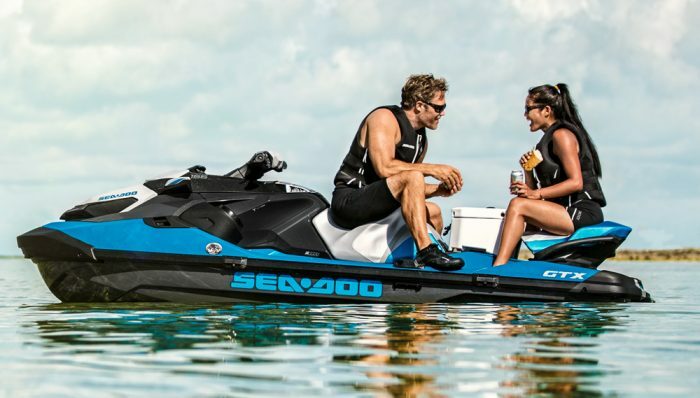 Sea-Doo hopes the answer will be to increase the craft’s versatility. With the seat removed, the new ultra-stable hull design allows passengers to sit on this gently sloping area and use it like a boat’s swim platform. You can also place the removable portion of the seat (unsecured) at the back half of the platform and use the cooler (unsecured) as a table with two passengers can face each other at rest. What seems like the most realistic option is to stand on the 366-square-inch deck and use it as a casting platform for fishing. The third new feature is Direct Access Front Storage, a total reversal of the way PWC owners have traditionally viewed, and used, storage. 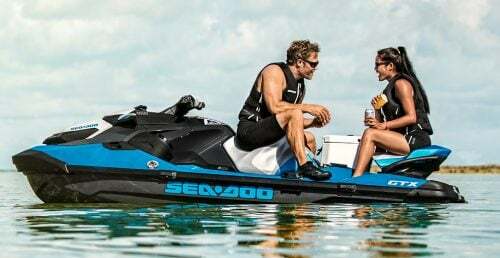 Rather than bow storage with a hatch that requires the rider lean awkwardly over the handlebars when accessing the compartment while out on the water, Sea-Doo’s new take on storage moves that compartment slightly aft so that it is now located directly in front of the saddle. The “hatch” is now the entire steering console and glovebox. With the release of two pull-up levers directly in front of the driver, the whole assembly now opens toward the driver, making it possible to simply reach in and retrieve or stow what you need while seated. A gas shock takes the weight off the assembly and keeps it in the open position. Capacity is down from the former 42.8 gallons to 27 gallons total, but the decrease seems hardly noticeable. The space within seems abundant, although I’d suggest adding the optional storage dividers to keep it all from becoming a jumble in one large tub. The system has its tradeoffs. The glovebox is now pretty much just a spot to store your phone (in a padded, watertight box), meaning you’ll need to raise that storage lid any time you want to grab those little items — like a water bottle — you used to keep close at hand. I also question the placement of the fuel fill within, although it is partitioned off from the rest of the storage area and features drains to channel away any spills. And then there’s the fact that you can raise the hatch while idling, which obstructs your forward view. Obviously you’ll need to use some common sense when accessing underway and ideally put the craft into neutral. Like the other three new features, however, I found the setup to feel surprisingly solid. I found virtually no play in the hatch when open and nary a rattle or vibration when closed.